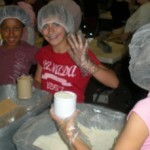 Feed My Starving Children is an organization based in the Twin Cities that packs and ships food to the poorest people in the world, supplying aid stations and Christian relief efforts in Haiti, Eastern Africa, and elsewhere. This food is specially designed to supply the physical needs of malnourished people. About half goes to children. Volunteers pack this food in large-scale, energetic, joyful events that even the very young can be part of. Groups can travel to Eagan to be part of ongoing packs. Owatonna has held a community packing event in the fall since 2011. Watch for more information on the 2019 pack! We are helping families with laundry needs, primarily those on the waiting list for Transitional Housing or referred to us by Rachel’s Light. Once a year in August we cancel a worship service and go out into the community to serve instead. Past service projects have included Steele County Food Shelf, Steele County Clothesline, Habitat for Humanity of Steele/Waseca Area, Senior Center, The Sandwich Project, and the Owatonna Park System. Help hungry Owatonna school children have enough to eat on the weekends. 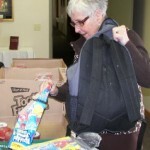 We pack a backpack for grade school and preschool children identified by school officials as having chronic needs. We pack the backpacks during the week here at church, then deliver them to the schools. We also give more complete meals in boxes to families in need, including fresh and frozen foods. Our quilters have made hundreds of quilts! Half of what they create is sent overseas with Lutheran World Relief. The rest are divided between various non-profit ministries in Steele County and Minneapolis. Quilts are also given to each child baptized at Good Shepherd. Quilters meet once a week at church during the school year, and always welcome new volunteers. Provides clothing for our neighbors in need . This organization can use individual volunteers any day. Wednesdays and Thursdays are the best days for groups of 4 to 6 to volunteer. Call Mary at 507-451-2550, or go to their website. In Owatonna there are seniors who need help with their yard work. Individuals, families, and groups who want to help can contact Healthy Seniors of Steele County at 507-475-1494. Hospitality House is the temporary homeless shelter for men in Owatonna. We can help by providing meals or supplies. Call Joleen at Hospitality House at 507-444-4042, or her cell 507-213-7527. We are working alongside inmates at the Steele County Detention Center to grow fresh vegetables for the Steele County Food Shelf. The food shelf loves the produce and we enjoy engaging with the inmates on work release. Take a lunch hour and deliver meals to homebound members of our community. We deliver every Tuesday during May and August. Every year in August, 300,000 people attend the largest county fair in Minnesota right here in Owatonna, bringing visitors and workers from all over the country. Every year Good Shepherd works with Trinity Lutheran Church to provide a meal for the workers the night before the fair opens. 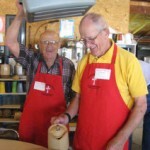 These folks normally live on fair food, so they love the milk, fruit, and hospitality of people who gather to give. Provides decent, affordable housing for families which otherwise would not be able to own their own home. Often these families have endured some form of hardship. There is usually an opportunity for individuals or groups to work together on some form of the building process (it may be siding, drywall mudding, painting or landscaping) on Saturdays in the summer, fall, and late fall. Call Pat or Tina at 507-446-0112, or check their website. On a Saturday in September volunteers wade into the Straight River to clean debris and litter from Steele County’s main waterway, fishing out old tires, plastic, furniture, and other items you won’t believe from the river bottom, and getting dirty for a good cause. This is not a job for the feeble, but individuals, families or groups can join in getting wet together. Call Leslie at the Cannon River Watershed Partnership at 507-786-3913 for more information.